Shame on me, I haven’t been around for awhile again. I have a good reason for it I promise! I am starting a part time job on top of my full time job AND I started a Kung Fu class a couple of weeks ago (which is crazy hard, but way fun) so needless to say art has taken a backseat for awhile. I am so excited about my new part time job, it is going to be way less stressful than what I am doing now and a lot more fulfilling. I also get to work with a group of really great people, which is just the icing on the cake. I don’t want to go too much into details just yet because it’s still sort of unofficial, but the idea is I will be transitioning into a full time position in the next couple of months. Details to follow! Along with the job related stuff I am going through some other significant life changes right now and as a result have been thinking a lot about strength. 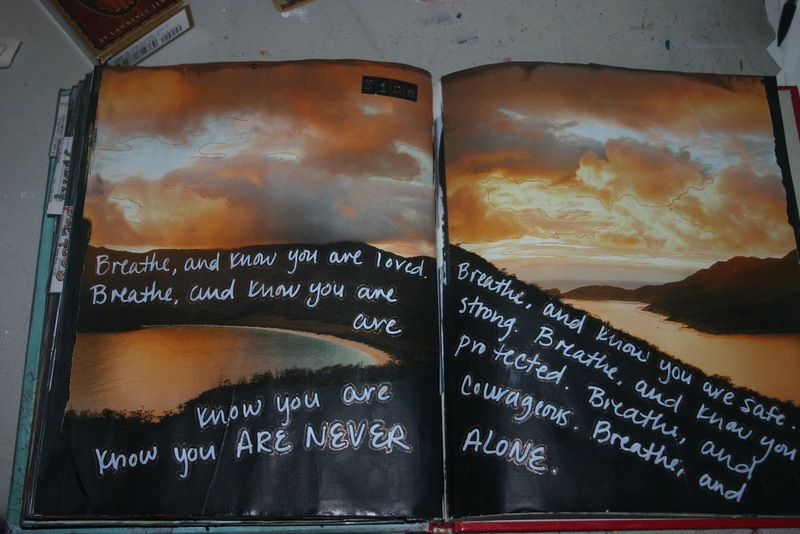 There are days where I feel so helpless and weak, I have trouble accessing my inner strength sometimes. This piece was a bit of a reflection on what it means to have inner strength. The woman in the photo is my Great, Great, Great Grandmother Amanda Powell Buchanan. 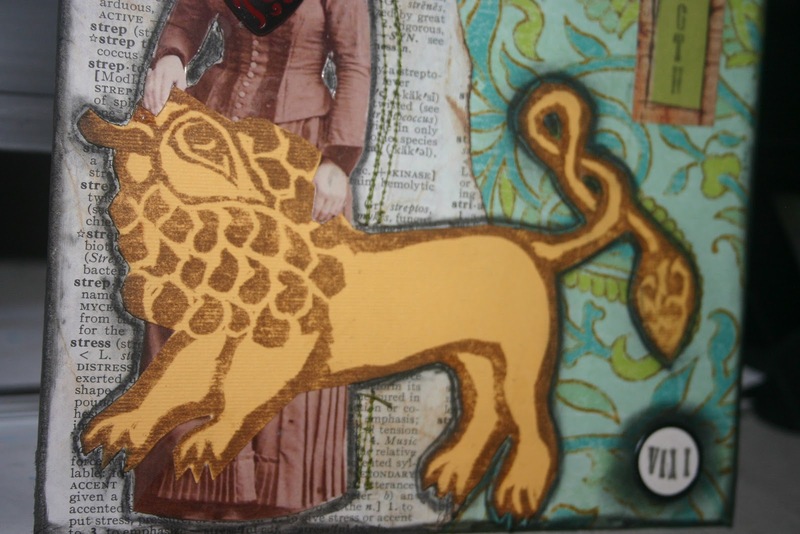 The Powell’s originated in Wales so I knew I wanted a Celtic lion image for this particular piece to honor my ancestry. I don’t tend to have pictures of Celtic lions just laying around so I had to design and hand carve my own stamp to get the image I wanted. I took a couple source photos from the internet and combined them till I got something I was happy with. 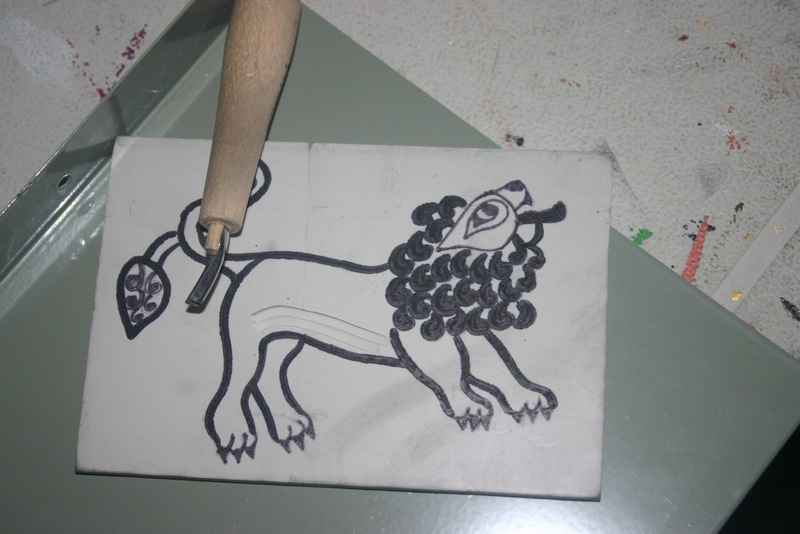 Here the picture is drawn onto the stamping material and I just started cutting it out. I have always felt a strong connection to my Grandmother, though I have never met her. I love this photo of her, she is so beautiful and I believe she was a very strong and confident woman. 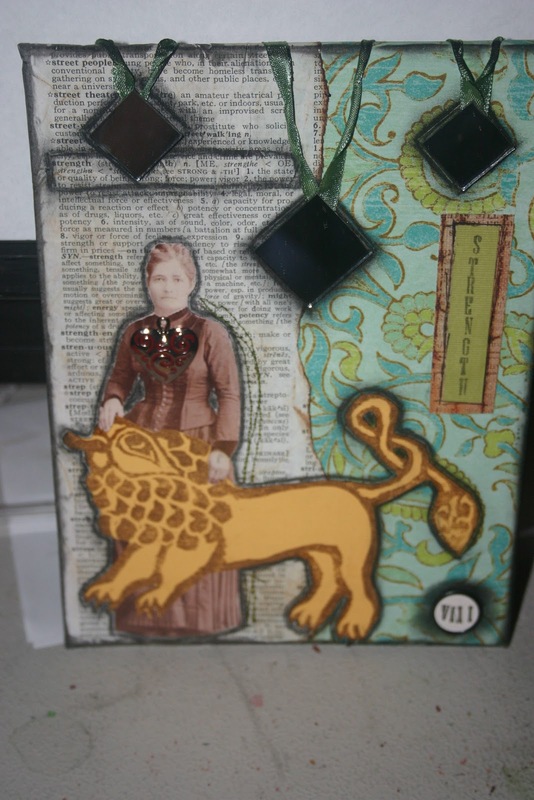 When I started doing my Tarot card series I knew immediately I wanted to use her for Strength. 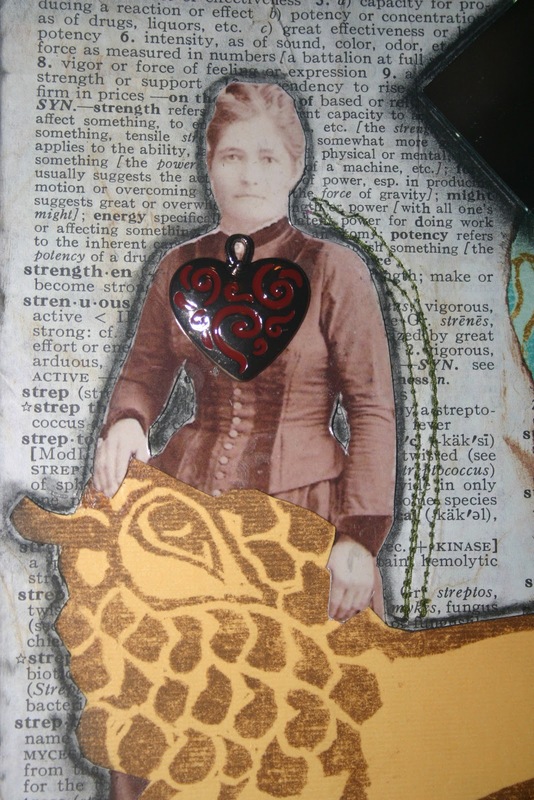 I added the heart shaped pendant to the final piece as a statement that true strength comes from the heart. Since I am sadly lacking on material to share with you all I have a few more pages from my Gratitude Journal that I thought I would share. 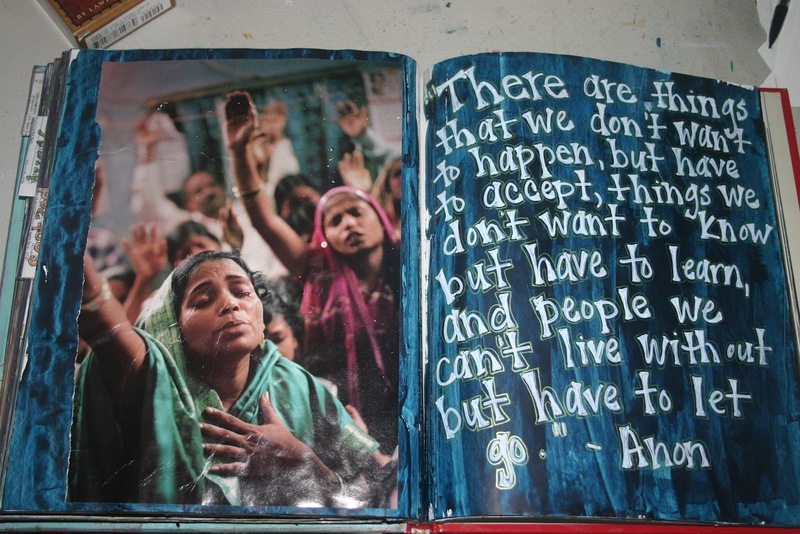 I am really into quotes right now if you can’t tell. 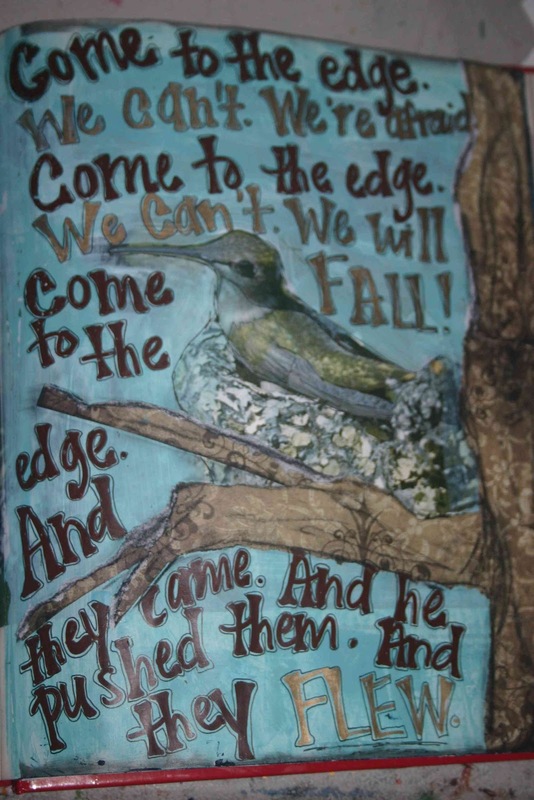 The bird is actually an image on the page from the original book, I just painted the background, added the tree and the text. This is a riff off a Thich Nhat Hanh meditation I found. I adapted the words to suit me. Hope you enjoyed, please continue to check back. I may not have artwork to share, but I have been doing a lot of cooking so you may get some sneak peaks at some of the crazy recipes I have been trying! It’s a soaring hawk for obvious reasons (read my first post here), but there is a lot of other symbolism in this design for me as well. I really wanted a Celtic design to honor my ancestors who came from Ireland and Scotland. Family is incredibly important to me as well as knowing where I come from and the people who have come before me. The Celtic knots themselves symbolize life having no beginning or end as well as everything being connected. The center of the hawk there is a heart with a triskele symbolizing the mind, body, soul connection and how spirituality is super important to me. 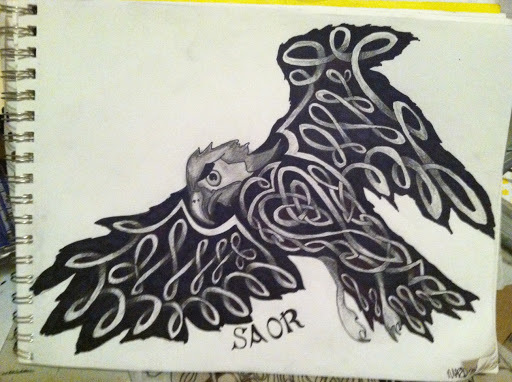 And finally below there is the word “SAOR” which, if correctly translated, means “free” in Gaelic. I am debating between that or the phrase “Forever Incomplete” (Heck yeah Alanis check out the song here- Incomplete), but I am still waiting on the Gaelic translation for that one. I would like the head of the hawk to look more realistic, but that is something the tattoo artist is going to have to manage for me, I am not good with photo realism. So that’s my dream tattoo. I would probably get it across my right shoulder blade in either just black or I am seriously considering having it done in sepia so it would be more subtle. Any thoughts? I need to save some money before I can get it done because I have a feeling with the amount of detail involved it will be expensive. 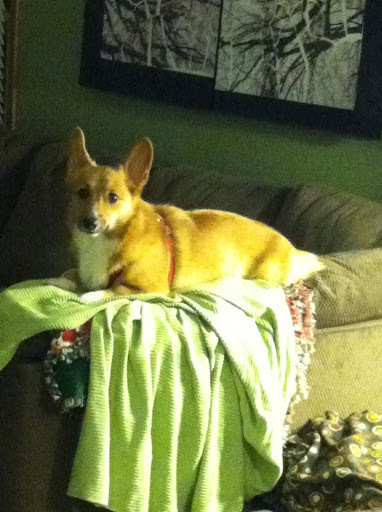 I have never seen him lay on the back of the couch like that before and frankly he knows better. I think he was there because his green blanket was laying across the back. Carwyn is our big boy, he’s almost four years old… the baby’s name is Rhett will be one in January. His picture is above my profile. They are my little furry children!